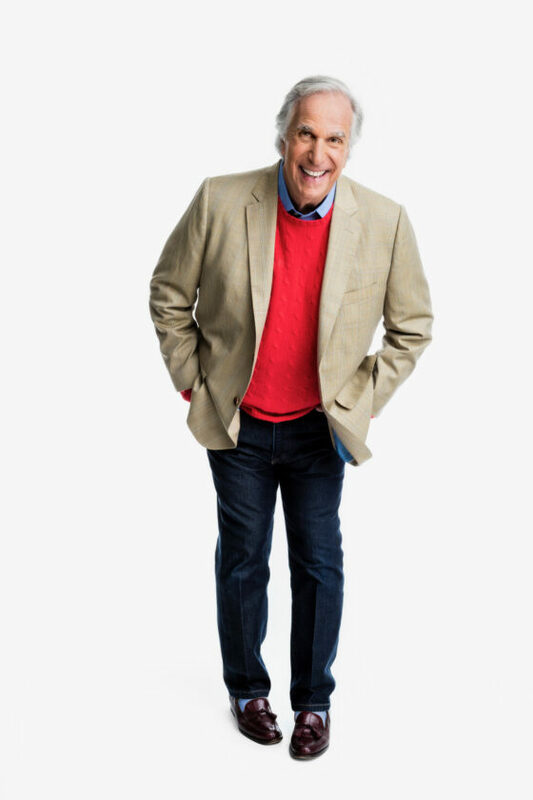 Henry Winkler co-stars as acting teacher Gene Cousineau on the hit HBO dark comedy, “Barry.” This past September, he was the recipient of the Emmy Award for Best Supporting Actor in a Comedy for his role on the series which stars Emmy-award winning actor, Bill Hader. He also won the Television Critics Choice Awards for Best Supporting Actor in a Comedy Series and received nominations for a Golden Globe and SAG Award. The series returns for a second season on March 31, 2019. A 1973 audition in Los Angeles forever changed the life of the Yale School of Drama graduate when producer Garry Marshall and Tom Miller cast Winkler in the iconic role of Arthur Fonzarelli, aka “The Fonz,” in the TV series “Happy Days.” During his 10 years on the popular sitcom, he won two Golden Globe Awards, was nominated three times for an Emmy Award and was also honored with a star on the Hollywood Walk of Fame. Both his famous leather jacket and Fonzie’s lunch box became part of an exhibit at the Smithsonian Museum in 1980. In recent years, Winkler appeared in a number of series, including “Arrested Development,” “Children’s Hospital,” “Royal Pains,” “New Girl” and “Parks and Recreation.” He also starred and co-executive produced the NBC Reality travel series, “Better Late Than Never,” with William Shatner, Terry Bradshaw, George Foreman and Jeff Dye and is an executive producer of the new “MacGyver” series currently airing its second season on CBS. His guest role in the ABC drama series “The Practice” earned him an Emmy Award nomination and he also starred in the CBS sitcom “Out of Practice.” His guest-star roles have included “Numb3rs,” “The Bob Newhart Show,” “Third Watch,” “Crossing Jordan” and “Law and Order: SVU,” and the Hallmark Channel holiday movie “The Most Wonderful Time of the Year.” He has lent his voice to such shows as “All Hail King Julien” on Netflix, “South Park,” “King of the Hill,” “Family Guy,” “The Simpsons” and “Clifford: The Puppy Years,” for which he received a Daytime Emmy Award. Behind the scenes, he has also made his mark as a producer and director. Winkler has executive produced or produced TV series and specials for 19 years, including “MacGyver,” “So Weird,” “Mr. Sunshine,” “Sightings,” “A Family Again,” “All Kids Do It,” (which won him a Daytime Emmy Award), “Ryan’s Four,” “Scandal Sheet” and the ABC documentary “Who Are the DeBolts and Where Did They Get 19 Kids?,” which won the prestigious Humanitas Prize. Winkler has always been concerned about the quality of children’s television programming. He has produced countless worthwhile projects for young audiences, including “Happily Ever After” for PBS and its sequel, “Two Daddies to Love Me.” Additional specials include “Run, Don’t Walk,” and “All the Kids Do It,” which was about teenage drunk driving (he also directed). Winkler can also add to his resume the title of New York Times best-selling author. His first book, “Niagara Falls or Does It? Hank Zipzer the World’s Greatest Under-Achiever,” became a bestseller. The book was inspired by Winkler’s struggle throughout his education due to his learning challenges. To date, he and his co-author, Lin Oliver, have written 34 children’s novels. Their latest (and last in the series) is HERE’S HANK: Everybody is Somebody. All the books are sold in bookstores and online across the United States and have been published around the world in seven languages, with more than 4 million copies sold. They are currently at work on a new series due to be published later this year. He also received the Chevallier de l’Ordre des Artes et Lettres, the French government’s highest honor. In addition, Winkler was one of 10 individuals honored by AARP with their 2010 Inspire Award.